Adam L. Penenberg’s “Viral Loop” was published in 2009, but retains a lot of relevance in 2011. Its subtitle is “From Facebook To Twitter, How Today’s Smartest Businesses Grow Themselves”. The book begins by telling the story of the web site “Hot or Not” and how that web site (in 2000) “rode a simple idea to a fortune”, by virtue of “an insanely viral scheme”. It goes further back in time to the original viral models, Tupperware and Ponzi Schemes and then works its way up through many of the present day (or past-present day) Web 2.0 success stories (e.g. Mosaic, Netscape, Ning, Hotmail, eBay, PayPal and more). Early in the book, Penenberg explains the “viral coefficient”, or the “number of additional members each person brings in” (to a web site or service). The success of a web site, or even a YouTube video, “going viral” hinges on this figure. Penenberg explains that if the coefficient is equal to 1, the site “will grow, but at a linear rate, eventually topping out”. Then, “above 1, it achieves exponential growth”. The early growth of Ning was due to the fact that its viral coefficient was 2.0 – “each person who signs up is worth, on average, two people (compounded daily)”. And while Ning doesn’t attain the lofty position it once had, its viral coefficient (and how it achieved it) is important in understanding its early success. In addition to explaining viral coefficients and how viral loops are created, Penenberg provides interesting history lessons (stories) behind some of the web’s most well known creations. He tells the story of how Marc Andreessen created the Mosaic browser at the University of Illinois in Urbana-Champaign, left Illinois to move west to Silicon Valley, and there co-founded Netscape with Jim Clark. Version 1.0 of the Netscape browser was released on December 15, 1994, and Netscape engineers “rigged servers so a cannon fired every time a browser was downloaded”. In a chapter titled “eBay and the Viral Growth Conundrum”, Penenberg tells the story of Pierre Omidyar, whose inspiration for eBay came from a stock order gone bad – he placed a pre-IPO order for a stock, only to see it jump 50% on the day of its IPO. Omidyar, whose business was called AuctionWeb, hosted the site on eBay.com because his desired domain, Echobay.com, was already taken. The chapter “PayPal: The First Stackable Network”, takes us through the very genesis of PayPal, starting with a lecture at Stanford, given by Peter Thiel. Max Levchin was one of six in the audience. They agreed to meet for breakfast the next week and over breakfast, agreed to launch a start-up around Levchin’s ideas for cryptography software. The initial company was called Fieldlink and went through a few iterations of cryptography business ideas until they settled on the idea that would become PayPal. Before reaching the Epilogue, we learn about the beginnings of several other well-known names, including Flickr, MySpace, Bebo and Facebook. 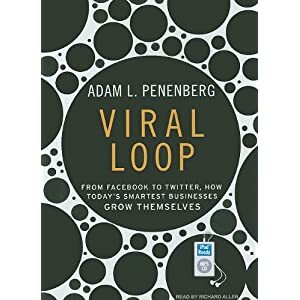 In the Epilogue, Penenberg summarizes the characteristics of viral loop companies and compares the similarities to human population growth – “the human population growth rate [also] mirrors the curves for companies like Skype, Hotmail, Ning, Facebook”. Penenberg’s book makes me ponder the coming decade (2011-2020). What new viral loop companies will be created (and how) – and who will be this decade’s Hot or Not, Ning and Netscape? This entry was posted on Saturday, February 12th, 2011 at 6:00 AM and is filed under Book Publishing. You can follow any responses to this entry through the RSS 2.0 feed. You can leave a response, or trackback from your own site.